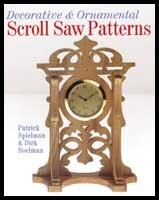 This book is a pleasure to have and use for various scroll saw projects. It is a project book with patterns for almost every occasion. The projects range from novice to expert skill level. I was especially impressed with the "story book" presentation. Each project has a photograph of the completed project on the same page as the pattern. This is very handy when deciding which project to tackle and gives ideas on the possible finish of your work. There are some general tips in the front of the book, but the book gets right into its purpose very quickly which is to present designs and projects that can be accomplished by the scroller for every occasion. The projects are well thought out and presented with an excellent graphic array of ideas and tips. Some projects have helpful suggestions displayed with the pattern and picture on how to complete the work and present the finished project. I have one bit of constructive criticism and it applies to most project books that I have purchased for scrolling. The binding is not conducive to making a copy for use in gluing to wood. I would pay the extra money to get a spiral bound book that will lay flat on the copy machine. Editor's Note: Sterling Publishing has graciously donated several books for review which are passed on to our members free of charge in exchange for thoughtful, honest reviews. Thank You!